During our early teens in Derby, Maine, a friend and I encountered 2 youngsters during an incredible and scary sight. On the way to the iron bridge over the Piscataquis River, we took a shortcut through the old baseball field rather than take the railroad tracks. That day was clear and unusually hot pushing 90 in the shade. 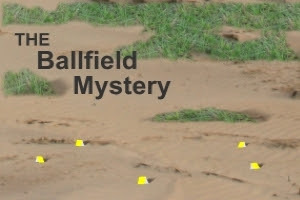 The ball field was long abandoned and grown over in many places with very large patches of sand in the infield. It was in a remote spot at the end of town, and the open field was hidden back 50 feet behind some trees. As we rounded a corner into the opening, there they were. Two boys, probably 8 or 9 years old, were crawling very slowly across a stretch of sand, and gasping. They barely moved. From the trail left in the sand they had crawled a good 10 yards at least. Running up for a closer look, we asked what happened and were they all right. One turned slowly as if in agony, coughed once or so, and then gasped “We’re… okay. We’re… playing desert.” We left ’em crawling. The desert adventure and pantsload of sand would have to wait for another day. Reflecting on moments like that make me wonder about childlike imagination. A few years later I had the pleasure of crawling in sand through barbed wire with 50 caliber machine gun fire whistling overhead. Those boys had it made.